Matt Grayson talks about why you should pay attention to the edges as well as the middle of your photographs. John Riley takes a look at the A&P series lenses. Roy Hampson shows us how a little bit of politeness can get us into some really interesting places the public don't always see. John Riley sets his imagination free with a little help from Photoshop. Matt Grayson gets a hands-on look at Pentax's new zoom camera. Frank Donato left Disneyland to start a career in fashion photography. 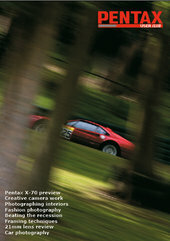 Ben Lowden is a professional car photographer and he has a few tips on how we can make our photographs of cars shine. David Askham puts the 21mm lens to the test. David Askham says we can still enjoy photography even if our pockets are empty. This issue’s sponsor is Reallusion who are offering FaceFilter 2 as the prize. FaceFilter 2 is a highly automated photo-editing tool designed for novice users looking to edit their first photos or for seasoned professional photographers needing to enhance facial characteristics or expressions in studio portraits. For beginners there’s an automated five step editing process, while more advanced users can use FaceFilter to attempt high quality facial image reconstruction and change facial expressions, facial feature orientation and filter skin tones. Every picture printed in the Gallery wins the FaceFilter 2 program worth £30.